← May 13 – 37 days to go. The old steak in shorts trick. My dentist tells me that, every time I brush my teeth, I should brush for at least two minutes. In fact, I now have a fancy electric toothbrush that runs for exactly two minutes. It also beeps every 30 seconds to prompt me to move from one quarter of my mouth to another. How convenient! I’ve decided that I can use the timer to improve my balance and strengthen those “little” muscles that we rarely hear about. 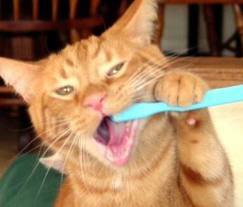 For the first minute of brushing, I stand on my left foot. For the second minute, I switch to my right foot. It gives me something to do for an otherwise boring two minutes and generally improves my balance, stability, and strength. Next, I think I’ll try it on a BOSU ball.